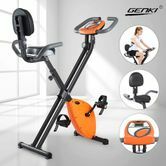 Burn fat and get the toned body with this Genki upright exercise bike. Thanks to its large digital LCD display with visible distance, speed, time, calories, this magnetic exercise bike will track your fitness progress effectively. The exercise cycle with 8 adjustable magnetic resistance guarantees you to maneuver your preferred level. The upright bike with cushioned seat which will offer maximum comfort during exercising. The height of the seat is designed to be adjusted to suit different heights and ages. For your peace of mind, the backrest attached with handlebar will provide continuous safety and comfort even when you focus on exercising. The large non-slip pedals with foot straps greatly ensure safety and balance even under high intensity workout. Look no further than this exercise bike to start your fitness journey for a totally new and healthy body. 8 Level Resistance System: The smooth 8 level magnetic tension control system with a durable 2.5kg solid flywheel allows the user to adjust for an easier or more challenging work out via a knob. User-Friendly Seat: There are 8 seat height levels to be adjusted which make it suitable for people of different height and age. At the same time, a comfortable posture of riding is possible. All your family can work out on it happily. There are 7 holes in the seat post allowing for a range of seat height can be adjusted. Non-slip large Pedals: Large pedals make riding easy in any shoes. Comfortable Seating: The padded lower back pad, large anatomically designed seat, and multi-grip padded handlebars are designed for long lasting comfort and support. It was just what I needed. I was left with weakness in my left leg as a result of a damaged sciatica. The physical therapist suggested a stationary bike with back support. It has helped build the strength in my left leg as well as giving me a cardio workout. I can fold it and set it in the corner of the room out of the way. I use the bike four or five times a week. I am happy with the purchase. I can sit and watch TV while riding this stationary bike it is quite and has different settings to adjust the intensity of your workout. Great product for the money.